Electorates in Kaduna State on Wednesday threatened to vote-out dormant federal and state lawmakers during 2019 general election. 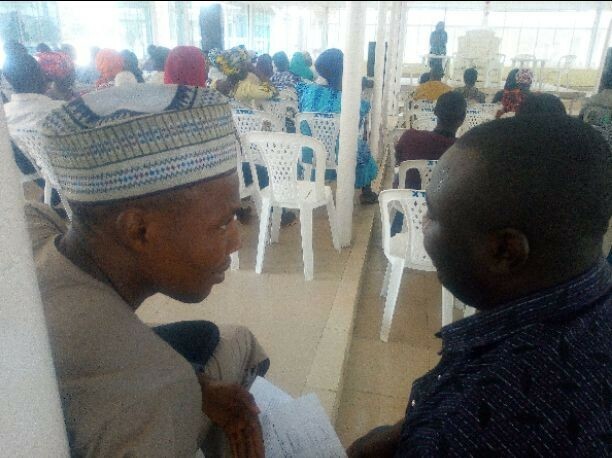 The electorates, who were reacting during a constituency briefing organised by a non-governmental organisation, Gender Awareness Trust (GAT) with support from Christian Aid said, they are now aware of the power of their permanent voter’s card (PVC) to do the needful when the time reach. These electorates have gathered themselves together at Barnawa with the hope of seeing the lawmakers representing Kaduna South and Chikun Constituencies in the State House of Assembly, but were disappointed because that of Kaduna South neither come nor represented while that of Chikun was represented. “We would have loved to talk directly with our lawmakers but they are not here because they are busy. They have been busy close to three years now and we are not seeing the result of that. “But when they want to come and campaign, they will not be busy. Its okay. We are waiting for them to come and campaign for re-election. But they should know we are better informed now about what we can do with our PVC. We will vote out any of them who has not performed based on their campaign promises”, they said in chorus. Village Head, Down Quarters, Makera, located in Kaduna Local Government area of the State, Alhaji Danjuma Musa highlighted linking roads, perimeter fence around Government Secondary Makera and security of lives and property of members of his community. “The constituency briefing that has. brought us together is a good one because it will afford us the opportunity to remind our representatives our top needs as we prioritise them. “Like we at Down Quarters, we need linking roads especially the one that we link us with United Textiles. That is our top priority for now. But again, we need government to come erect a perimeter fence around our secondary school so our children can be protected while in school. “In addition, looking at the security situation across the country, we need security in our community. This is because even if your people are peacemakers, criminals may come from different community and launch attack on your people. We don’t have to wait for this to happen before taking steps. Reacting to the allegation that 90 percent of people often make personal demands instead of collective needs from their representatives which is hindering community development the traditional leader said, that happen because the representatives have distant themselves from their communities. “Yes, you can help the needy in real sense. But you have to understand that, if they are close to the people and influencing projects that will lead to overall development of their communities, that will naturally reduce the burden of so much personal demands”, he noted. Responding to some of the community needs which include functional primary healthcare centre, schools, electricity transformers and drainage, Member representing Chikun Constituency in Kaduna State House of Assembly, Markus Zarmei Yari told his people to be patient with the government as all their needs would be attended to. Represented by his Secretary, Grace Augustine, the lawmaker said, apart from writing him formally, locals could also approach the constituency office located opposite Living Faith Church, Sabon Tasha Kaduna between 10 am and 2 pm week days to lodge complaints and book appointment with their representative whether as individual or as group. However, absent of the lawmaker from the meeting was not welcome by the locals, urging him to reschedule the meeting and not wait until election time which they say may be too late as they are now better informed of the power of their permanent voter’s card. Earlier, Project Officer, Voice to the People (V2P) project supported by Christian Aid and being executed by Gender Awareness Trust (GAT) in the State, Stephen John said, the constituency briefing became necessary in order for the lawmakers to interface with their people with a view to come up with legislation that will address their top needs. These top needs as contained in a document called Community Development Charter (CDC) developed to help the locals to prioritise their needs and make same available to the government for budget processes. According to Stephen, V2P project has built the capacity of communities across the 23 local government areas of the state in terms of making their voice heard by their policymakers so that, budget can be developed based on what the people really need and not what the government felt they need which was the case before now.